Republican Sen. Orrin Hatch of Utah highlighted that he was named The Salt Lake Tribune’s “Utahn of the Year,” tweeting that he was “grateful” for the honour. But the editorial said he had an “utter lack of integrity” and called on him to not seek office again in 2018. 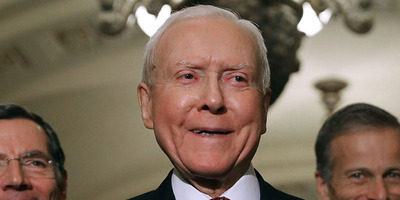 Republican Sen. Orrin Hatch of Utah tweeted Monday night that he was “grateful” for the honour of being named The Salt Lake Tribune’s Utahn of the Year. While on the surface that honour would seem to be one worth highlighting for the senator, a quick read of the Tribune’s editorial shows that the publication did not bestow him with the recognition for positive reasons. As reasons Hatch was chosen, The Tribune cited “his utter lack of integrity that rises from his unquenchable thirst for power” and what it called an “anti-environmental, anti-Native American and, yes, anti-business” move to scale back two major national monuments in the state. Though the publication wrote of Hatch’s major role in passing Republicans’ tax overhaul in a more positive light, the editorial board wrote that the legislation’s passage was all the more reason for him to retire from office after serving for more than 40 years. “But perhaps the most significant move of Hatch’s career is the one that should, if there is any justice, end it,” the board wrote. “The last time the senator was up for re-election, in 2012, he promised that it would be his last campaign. That was enough for many likely successors, of both parties, to stand down, to let the elder statesman have his victory tour and to prepare to run for an open seat in 2018. This post has been updated to include comment from Hatch’s office.